I throw the word classic around a lot but tortilla soup really is a classic. Every Mexican cook has a variation. This is mine. I defy you to find anyone who doesn’t love tortilla soup. 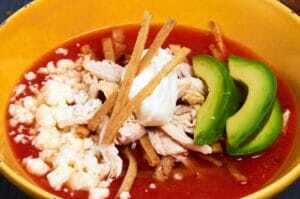 If you are not familiar with it, it’s shredded chicken in a rich and spicy tomato broth balanced with avocado, cheese and sour cream with tortilla strips added for crunch. Sounds good, doesn’t it? Looks good too! Print the recipe or work through the recipe with the step-by-step photos below. Leave a comment below to let us know how the recipe worked for you. 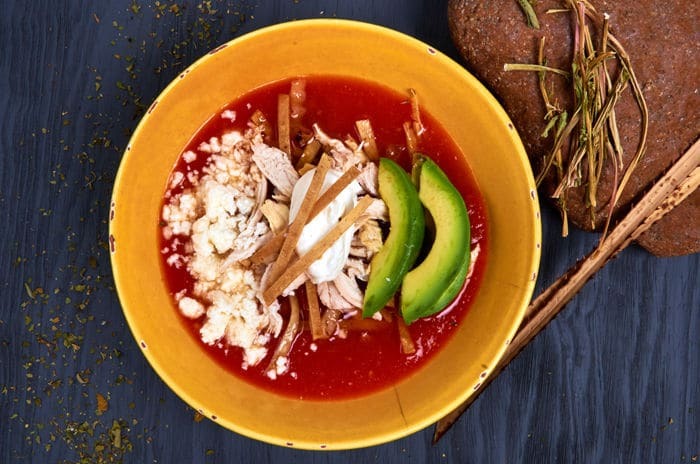 Classic tortilla soup (sopa de tortilla) - shredded chicken in a rich and spicy tomato broth balanced with avocado, cheese and sour cream with tortilla strips added for crunch. 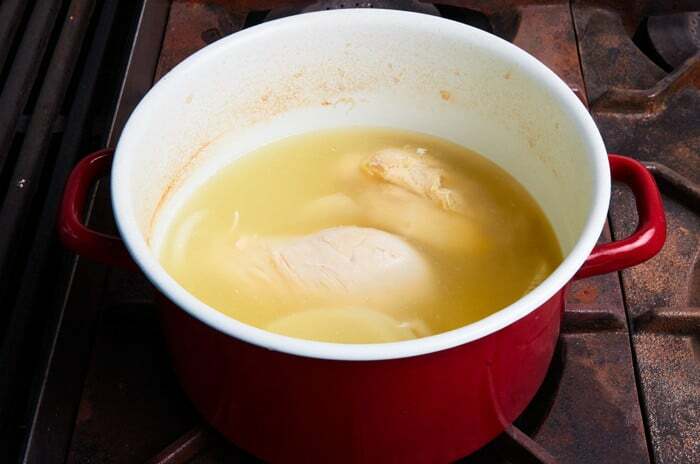 Place your chicken breast in a pot with 4 cups cold water with 1/2 of the white onion and 2 cloves of garlic. Bring to a boil and reduce to a simmer and simmer for 20 minutes until the chicken is just cooked through. Remove the chicken from the cooking liquid and allow to cool. Shred the chicken into thin strips about 1 to 1 1/2 inches long. First, remove the stem and the seeds from the morita chile and then soak it in a few ounces of hot water to soften it (10 to 15 minutes) You can do this while you are preparing the chicken. Blend the roma tomatoes, onion, morita chile and 3 cups chicken broth. Blend in 2 batches. After you have blended the ingredients, heat 3 tablespoons of cooking oil in a pot. Pour the soup base into the hot oil. Cook the broth for 30 minutes at a low boil until it takes on a deep red color and has reduced approximately 1 inch. Add the salt and adjust as needed. The broth should seem slightly salty. When you add all of the other soup ingredients it will reduce the saltiness a bit. 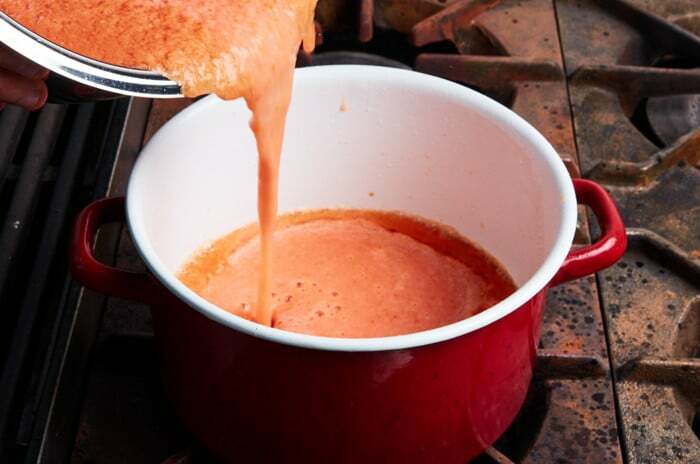 Pour approximately 1 cup of the tomato broth into a wide shallow bowl. Add 1/4 of the tortilla strips in the center of the broth. On top of the tortilla strips add 1/4 of the shredded chicken. Top with one generous dollop of sour cream. Add one ounce of shredded ranchero cheese and 4 avocado wedges. Garnish with a few tortilla strips. If you are unable to find morita chiles you can substitute 1 canned chipotle chile in adobo. Canned chipotles are available in the Hispanic section of most grocery stores. Many people like their tortilla soup with a squirt of lime. Give it a try if a little lime sounds good. 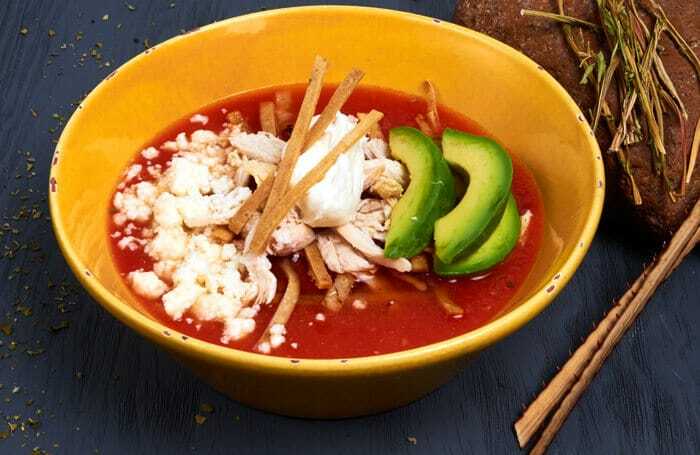 Tortilla soup doesn’t require any exotic ingredients. You probably have most everything you need in your pantry. If you can’t find morita chile a perfect substitute is canned chipotle chiles in adobo, available in almost every supermarket, which gives the soup a similar and equally delicious flavor. Place your chicken breast in a pot with 4 cups cold water with 1/2 of the white onion and 2 cloves of garlic. Bring to a boil and reduce to a simmer and simmer for 20 minutes until the chicken is just cooked through. Allow the chicken to cool and then use your fingers to pull it into thin strips. See the ingredient picture above to see what the chicken should look like. Save the cooking liquid. You will use it to make the tomato broth. Before preparing the broth, remove the stem and the seeds from the morita chile and then soak it in a few ounces of hot water to soften it (10 to 15 minutes). You do this so that it will blend smoothly and incorporate fully into the broth. If you don’t soak, it will break into bits that don’t incorporate into the soup. The broth is the most important part of tortilla soup. Don’t rush it. Take your time to do it right and you will be rewarded with a deeply satisfying soup. 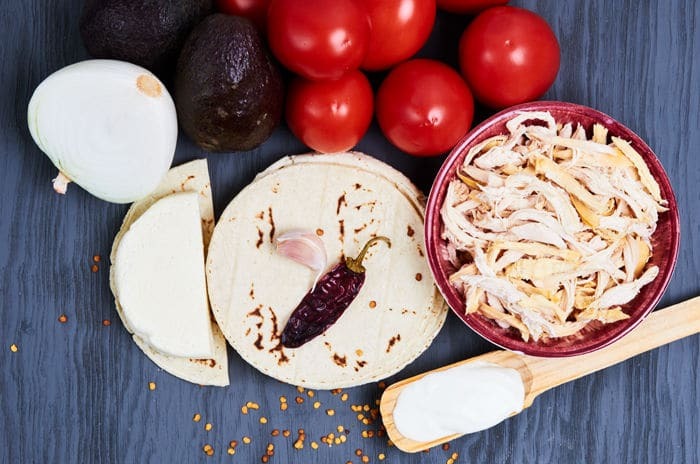 TIP: Make a double batch of chicken and broth and freeze them so that the next time you are in the mood for tortilla soup you can prepare it much more quickly. The redder, riper the tomatoes the better your soup will be. 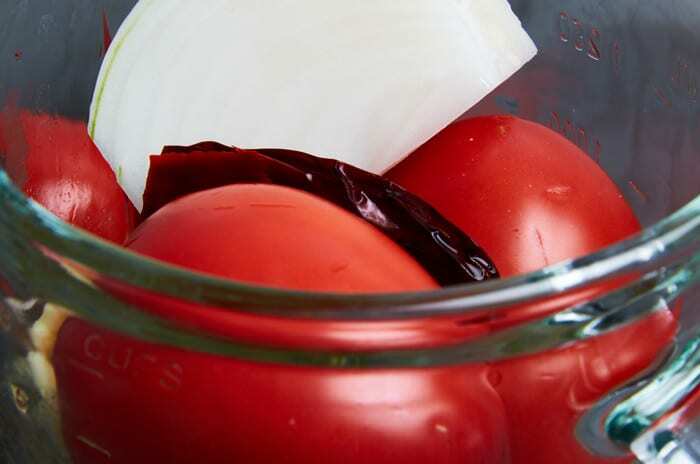 Blend the ingredients for the tomato broth: roma tomatoes, onion, morita chile, and chicken broth. You don’t have to slice the tomatoes or anything. Just chuck them into the blender whole. You will have to blend in two batches. Blend for at least 1 minute until the base for the broth is very smooth. Once you have blended the ingredients, heat 3 tablespoons of oil in a pot. Pour the soup base into the hot oil. Notice in the picture below how the hot oil forms a circle around the outer edge of the pot. This step develops a deeper flavor in the broth and helps to keep the broth from separating. Cook the broth for 30 minutes at a low boil until it takes on a deep red color and has reduced approximately 1 inch. You want the broth to have some body but not be as thick as a salsa. If your broth is too thick just add water a few tablespoons at a time until it reaches the consistency you want. After 30 minutes the broth looks amazing. If possible, allow the broth to rest for at least 2 hours so that the flavors meld. Resting overnight is even better. If you can’t wait and want to serve right away the soup will still taste great. Don’t worry. Now the fun part, serving your soup. 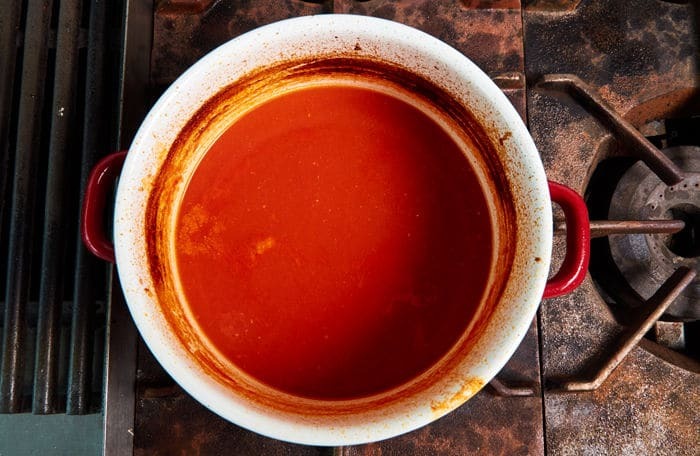 Pour approximately 1 cup of the tomato broth into a wide shallow bowl. Add 1/4 of the tortilla strips. On top of the tortilla strips add 1/4 of the shredded chicken. Top with one generous dollop of sour cream. Add one ounce of shredded ranchero cheese and 4 avocado wedges. Garnish with a few tortilla strips. Serve immediately. This sounds amazing but it is not tomato season yet. May canned be used and if so, how much? Thanks!